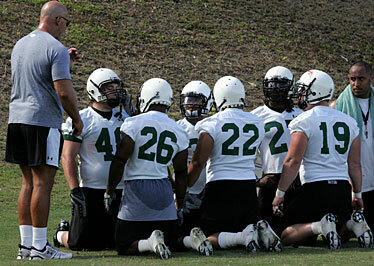 UH running backs gathered with assistant Alex Gerke, left, and student assistant Francis Maka, right. With his quarterback set to join the Hawaii football program after graduation, Deondre Powell was eager to keep Gahr High School's prolific pass-catch combo together. Like Gladiator quarterback Corey Nielsen before him, Powell, a slot receiver at the Cerritos, Calif., school, committed to join the Warriors for the 2009 season. He said he informed UH coach Greg McMackin of his decision yesterday afternoon. T.J. Alofipo LB 6-2 240 Silverado (Nev.) H.S. "We're really close, he's like a brother to me," Powell said of Nielsen, who committed to UH last month. "We had been talking about Hawaii and playing at the next level together since before our freshman year. Hawaii has sort of been like my dream school." Powell, 5-feet-9, 165 pounds, was Nielsen's top target last season when he led Gahr with 73 receptions for 1,244 yards and 11 touchdowns. He broke the 100-yard mark in five games, posting a season high of 219, for a Gladiators team that went 10-3. "Our whole offense is based off Hawaii's offense so we fit right into it," said Powell, who also had an offer from Arizona. Powell is the fifth player, and second receiver, to commit to the Warriors as part of their 2009 incoming class. The commitments can be made official when the signing period opens in February. The Warriors began practice with a period for special teams, concentrating on punt protection and coverage. The protection unit yesterday included several starters, linebackers Adam Leonard and Solomon Elimimian and safeties Keao Monteilh and Mana Silva. "As a football player I'll play anywhere the coaches need me," Leonard said. "The punt team's an important facet of the game so any players we need on that team no matter where you are on the depth chart, offense or defense, if we need you on the team, you've got to play." Khevin Peoples figures it's time to make an impact. The fifth-year senior out of Tampa, Fla., has returned to running back, where he played before he was moved to scout team safety last spring. He relishes the task, as running back figures to play more prominently in the offense. "I can do whatever it takes to help the team win, no problem with that," said Peoples, who was informed just over a week ago of the move. "(My last time at back) all we would do is block here, block there. We were basically a lineman, but 150 pounds lighter. Now we have more mental input into the system -- a chance to think on our toes very quickly, as if we are a receiver. Good deal." Second-year freshman wideout Royce Pollard made two impressive grabs on back-to-back reps yesterday. On the first, he tripped at the start of his route and was nearly flat on his back, but somehow managed to spring himself up off the grass horizontally in an instant when QB Inoke Funaki fired the ball his way. "That's something I need to work on, I was just rushing and fell," Pollard said. "When I saw the ball, I was just urgent and worked as hard as I could to get it." On his next sequence, he twisted behind and got a hand on the ball up the middle, then spun around to complete the catch on his back. Both earned cheers from his teammates. Senior cornerback Jameel Dowling, who is working toward graduating in December, was excused from yesterday's practice due to a summer class. JoPierre Davis, wearing No. 9 rather than the 16 he'd worn earlier in his UH career, took his place with the first unit. ... Practices today and tomorrow are scheduled for 4-6 p.m. at the grass practice fields.